Like the 5-out motion and the 4-out 1-in motion, this offense gives players the chance to read the defense and then make decisions which is crucial to developing players with high basketball IQ. The goal of the 3-out 2-in motion is to get the basketball inside. The closer the basketball is to the rim, the better the chances are that your team will score or at least get a quality shot. If you have smart low post players who can pass, this is a great offense to create scoring opportunities for perimeter players as well. There will be many scoring opportunities for perimeter players who are properly spaced and understand when and how to move without the basketball in this offense. The 3-out 2-in motion offense is most effective when you have two players who are comfortable and make good decisions in the low post. It means you have players who are active in the post, know how to cut and move without the ball, and can make smart passes. This isn't a great offense for teams who rely on dribble penetration as there is so much activity in the paint by having two post players. Having high IQ players is a necessity when running the 3-out 2-in motion. If your players can't read the game, they'll constantly be in each others way and the offense won't have the spacing or timing to make this offense a success. Develops Basketball IQ - As with all offenses that give players decision making opportunities, the 3-out 2-in motion offense allows players to read the defense, make decisions, and then learn from their success or mistakes. Takes Advantage of Mismatches - This offense gives players great one-on-one opportunities close to the hoop. Any time you have a size or skill mismatch, you can put them on the low block and attack. Offensive Rebounding - With two post players close to the basket, you're guaranteed to have players is good position for offensive rebounding opportunities. Fewer Driving Opportunities - With two offensive and defensive players roaming the post areas, there won't be many large gaps inside for perimeter players to attack. Must Have Low Post Scorers - The 3-out 2-in motion offense is run best when you have players who can score one-on-one in the low post. This forces the opposition to double which leads to many other opportunities in the offense. Long Passes - With only three players around the perimeter, players will be making long passes as they swing the basketball around the three-point line. This can lead to more turnovers, especially at the youth level. 1. Keep great spacing - To run the 3-out 2-in motion offense at a high level, there should be approximately 12-15 feet of space between players at all times. This gives players space to cut and drive and makes it difficult for the defense to help each other. 2. Never pass and stand - After passing, perimeter players can either cut, screen away, or use a screen set by a teammate. In the post, players must be ready to cut to an open space after passing. 3. Don't stand for more than 3 seconds - The less standing and watching players do the better your offense will be. Players can cut and replace or screen for a teammate to ensure the defenders are constantly moving. 4. On drives, players must move to open space - There are specific movements off-ball players must should make if a teammate attacks the rim. Making these cuts will increase the chances they'll get open for a shot and will also ensure the offense keeps good spacing. 5. If denied on the perimeter, cut to the basket - Players must be able to recognise when they're being denied on the perimeter and they need to back-cut. This will keep the offense running smoothly. 6. If strong side post is fronted, weak side post flashes to high post - This is a great opportunity for a high-low pass inside and easy score if your players are alert and execute this action immediately. In this offense, there are three perimeter players and two post players. As a general guide, the spacing between each player should be 12-15 feet when players are in their correct positions. All of these positions are interchangeable depending on the players you have, mismatches on the court, and the actions you want to include in your offense. For the perimeter spots, there will be one player at the top of the key (1) and one player on each wing just below the free-throw line extended (2 and 3). In the post, both players (4 and 5) will start the offense slightly above the low post box on each side of the key. Although they are free to move up and down the lane as long as they stay on the same side of the key. When catching in the low post, it's important that players catch above the low block. If they're too low, they will have limited scoring options since there is less space. Next up, I'll break down the different passes involved in the 3-out 2-in motion offense and the actions that can be run off each pass. If this happens, the player who was on the weak-side wing cuts to the top of the key and replaces at the top. After cutting, the top player replaces on the wing. After passing, the player at the top of the key sets an off-ball screen for the weak-side wing. They then cut to the top of the key as the screener takes their position on the weak-side wing. Once either option has been made, the player on the strong-side low block should be looking to post up just above the low block and create a passing angle to receive the ball. The weak-side post player slides up to the elbow to ensure the two posts are opposite each other. If this quick pass is made, the player in the high post should wait a second to see if the player with the basketball will immediately attack the rim before cutting to the low post. If the pass is made into the high post, the ball-side wing will immediately backdoor cut looking to receive a pass for the layup. If they don't receive the pass, they must clear out to the weak-side wing as all perimeter players fill around. This is a good opportunity for the high post player to attack one-on-one if they have a favourable matchup. This is a difficult pass to make as it requires the passer to skip both weak-side post players too, but it does happen. When it does, the player at the top of the key will always down-screen for the passer and then they replace each other. On the skip pass catch, the player on the wing should be looking for the immediate shot or an opportunity to attack the rim. The ball-side post player must step in to the middle of the key so that there are two good options for inside passes leading to open layups. They also have the option of passing into the high post and then back-cutting along the baseline as all perimeter players fill. If the pass to the cutter isn't open, the high post player can attack one-on-one or kick it back out to the perimeter and start the offense again. If none of these options are available, the player in the high post slides down to the low block as the opposite post player slides up to the high post. The basketball can then be passed into the low post or the ball can be swung around the perimeter once again. Immediately after passing inside, the passer sprints to the top of the key and screens for the top player to cut to the strong-side wing for a shot opportunity. They then fill the position at the top. This occupies the defense and creates room for the low post player to attack one-on-one. The other option they have is to cut baseline and look to receive the pass for a layup (this is why it's important the post player catches it above the low post). If they don't receive the basketball, they fill the weak-side wing while the two other perimeter players fill around. While this is happening, the weak-side low post player must cut to the weak-side high post to give the low post space to back down and score. If the weak-side post's defender attempts to double the ball, they will have an open cut to the hoop where they can receive the basketball for a layup. As discussed when talking about the skip pass, every time a pass is made from the wing to the high post, the wing player who passed the basketball must cut baseline to the opposite wing. Occasionally the pass back to the cutting wing player will be open leading to an open layup. When this happens, all perimeter players must fill around the outside. The player cutting from the top to the strong-side wing must make sure to cut wide to make sure the high post player still has space. From here, the player with the basketball can pass back out and reset the offense or look to attack their defender one-on-one. The only time the two post players should deviate from one player on each side of the key is when the ball-side post player is being fronted. In this situation, the ball-side low post should allow the defender to get front position and then keep them there. This triggers the weak-side post to flash to the ball-side high post, receive the pass, and then lob the basketball towards the rim leading the low post player into a layup. This action relies on good timing and having players who can execute the high-low pass, but it's essential to teach so that your players can counter being fronted in the low post. But this can be a tad confusing in the 3-out 2-in motion offense due to there being so much post activity around the key. Your post players must be ready to immediately space out and create driving lanes for perimeter players. Next let's discuss the on-court movements that should occur on penetration to keep good spacing, create passing angles, and force the defenders to make difficult decisions. Before a player drives from the top of the key, they must look at the position of the two post defenders. If there is a player in the high post, the player at the top should not drive drive in that direction. If both post players are located just above the low post on penetration, the post player on the strong-side must clear out to the short corner while the weak-side low post player can choose to dive towards the rim or step into the paint for a drop off pass. The two perimeter wing players are free to move up anywhere from the wing to the corner to create a good passing angle. So they all must get back quickly! When a perimeter player drives from the wing towards the middle of the key, the strong-side post player must slide down to the 'dunkers spot' on the baseline. The weak-side post player should still be on the high post for spacing but can dive towards the rim for a pass if their defender helps on the drive. As for the two perimeter players, the weak-side wing must read the defense and can move up anywhere from the wing to the corner to get themselves open. The perimeter player at the top of the key should also move to create a better passing angle but must remember they're the first person back on defense. When a perimeter player penetrates from the wing towards the baseline, the player on the strong-side low block needs to slide up to the high post to create space. If their defender helps, there should be a simple bounce pass to the high post for an elbow jump shot. The post player on the weak-side should step into the middle of the paint and will be open for a drop off pass if their defender helps. The perimeter player on the weak-side must slide to the corner and get ready for a catch and shoot. And the perimeter player at the top should look to create a passing angle while remembering they must be ready to get back in defensive transition. 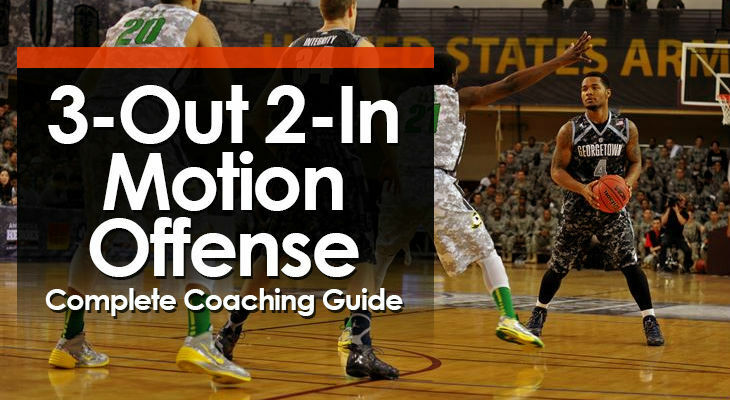 The 3-out 2-in motion offense is a fantastic option for coaches at any level of basketball. It's one of the most popular choices for youth coaches, but has also been utilised by elite coaches such as Coach Krzyzewski at Duke University. If you're looking for an offense that will develop basketball IQ, get you shots close to the rim, and give your team offensive rebounding opportunities, implement this offense.